In February 2015, CBLDF was confidentially involved the defense of the graphic novel edition of The Graveyard Book, which was challenged in an undisclosed middle school library for violent imagery. Ultimately a review committee voted to keep the book on shelves. In hopes of preventing any future bans of The Graveyard Book, we’ve put together these resources for librarians and educators who may need to justify and defend the inclusion of the book in library and classroom collections. Vol. 1: Gaiman’s frequent collaborator Russell brings his decades of comics know-how to this lovely, lyrical adaptation of the author’s well-loved, Newbery Medal–winning book. Not content to rely exclusively on his own distinctive talents, Russell has enlisted some of the industry’s greatest contemporary illustrators as contributors, who fill the panels with appropriately gothic tones. In order to give ample room to the novel’s twists and turns, the adaptation has been divided into two parts (the second will be released this fall). Running through the first five chapters and interlude of Gaiman’s original, this volume weaves the inviting magical story of toddler Nobody Owens, who escapes the brutal murder of his family and is adopted by the supernatural denizens of a graveyard. The well-paced narrative follows Bod as his new graveyard family raises him with care and attentiveness and he begins to explore both the ghostly world he inhabits and the outside world that is his heritage. Each illustrator brings a unique aesthetic, blending together seamlessly to enrich the tale and suggest the subtle shifts of clever Bod’s growth and burgeoning sense of adventure. Fans of Gaiman’s delightfully macabre sensibilities will be elated. HIGH-DEMAND BACKSTORY: Gaiman’s fans are loyal and plentiful. Add a Newbery Medal to the mix and this will be a barn burner. Grades 6-10. Vol. 2: Russell concludes the two-part adaptation of Gaiman’s Newbery Medal winner, encompassing the final three chapters of the novel. Bod, raised by the ghostly denizens of a graveyard, is a young adult now, yearning for knowledge of the world of the living. After a showdown with a pair of school bullies, nearly two-thirds of the book is given to chapter 7, in which Bod finally confronts the ancient order who murdered his family and overcomes them with his supernatural know-how and his innate courage and cleverness. A notable standout among the roster of talented artists behind the adaptation’s lush, detailed illustrations, Scott Hampton cultivates atmosphere and characters both meticulously realistic and eerily ethereal, appropriately recalling Gray Morrow’s gothic imagery from his time at Creepy. While the revelations are exciting and Bod’s first step onto the limitless paths of adulthood are poignant, dividing the overall tale in two parts sometimes makes the story’s momentum and lyricism feel a bit fragmented. Read together, however, as they were always intended, volumes 1 and 2 are a grand, elegant envisioning of Gaiman’s dark imagination. HIGH-DEMAND BACKSTORY: It goes without saying the Gaiman is a powerhouse, and fans of the lauded first volume of the project will eagerly turn out for this artful conclusion. By cutting out most of the descriptive text in this first of a two-part adaptation, Russell calls attention to the drama and wit of the language in each sentence. His graphic storytelling is faster-paced than the original book, but it’s always faithful, and a few readers may even prefer this version. Though he shares illustration duties with a team of graphic-novel luminaries—every artist gets a favorite monster or creature to draw—Russell’s fans will recognize his elegant, distinctive layouts even in the chapters he didn’t illustrate himself. The pictures also clarify one plot point. The original book was amusingly coy about whether a character named Silas was a vampire, but here he’s given the full Bela Lugosi treatment, and it’s beautiful. In Kevin Nowlan’s drawings, he has impossibly high cheekbones and a face like pale stone. One scene has even more impact than in the original: Ghosts join hands with the living and begin to dance, and readers see every dancer in the square. Vol. 1: As he did with Coraline, Russell makes the recasting of Gaiman’s Newbery-winning novel into graphic form look easy with this vastly entertaining adaptation, first in a two-book set (the second volume is due in late September). 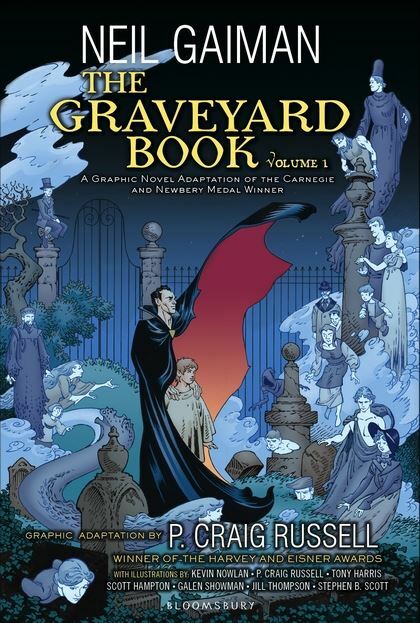 Russell conceives the look and layout of the graveyard world inhabited by Bod (short for “Nobody”), the infant who has escaped his family’s murderer; six artists, including Kevin Nowlan, Stephen B. Scott, Galen Showman, and Jill Thompson, contribute a chapter apiece. The overall effect is remarkably unified, and the thread of the narrative is always crystal-clear. 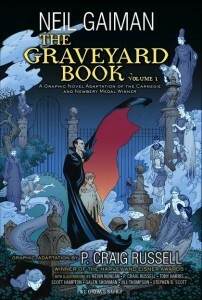 Bod’s devoted adoptive parents, the ghosts Mr. and Mrs. Owens, and the other graveyard inhabitants are dressed in evocative period costumes and drawn in ethereal blue, while Bod’s teacher and mentor Silas, about whose status the book was coy, is revealed as a vampire, with a splendid cape and a chiseled jawline. The artwork sets out to entertain rather than to horrify; even the initial murder scene has a certain tranquility. It’s a treasure worth having even if the novel is already on the shelf. Ages 8–12. Vol. 1: Gr 5 Up — The award-winning tale about an orphaned boy raised in a graveyard by ghosts is successfully adapted for the graphic novel format by Russell and his cadre of artists. The arresting opening image of a bloody knife sets the tone for this sometimes gory, but often playful, illustrated version. A toddler’s family is murdered by a mysterious stranger, and the denizens of the neighboring cemetery (ie. ghosts, vampires, and even a werewolf-type creature) take on the responsibility of being his caretakers. Renamed Nobody “Bod” Owens, the inquisitive boy grows up among the specters, making friends with a human girl, and escaping from several brushes with death. The panel’s dark blues, grays, and purples are punctuated with vibrant greens, yellows, and crimson red. Each chapter is illustrated by an artist or two, who in turn infuse the entry with their own technique, while reflecting the story’s original heart and atmosphere. Especially successful is the “The Hounds of God” section, illustrated by Tony Harris and Scott Hampton, which observant readers will note undergoes subtle shifts between the graveyard and the Ghoul kingdom. While some of the original’s subtlety is lost, this adaptation still celebrates friendship, loyalty, and family with similar humor and aplomb. The concluding interlude segues eerily into the next volume, for which middle graders will anxiously be waiting. Vol. 2: Gr 5 Up — Starting off where the first volume (2014) of Russell’s graphic novel adaptation of Gaiman’s The Graveyard Book (2008, both HarperCollins) ended, this title covers the second half of the original book. Orphan Nobody “Bod” Owens continues his education with the help of the ghostly graveyard residents, but soon experiences growing pains as he interacts more and more with the outside world of the living. His guardian Silas enrolls Bod in a human school, where the boy’s sense of right and wrong battles against his instincts to remain forgettable to his classmates and teachers. In the following segment — the most action-packed and thought-provoking — Bod is reunited not only with his childhood friend Scarlett but also with the murderous Jack, responsible for his family’s deaths. Now a teen, the protagonist grapples with feelings of revenge, honor, and even puppy love, all leading up to the work’s climax. A bittersweet and hopeful conclusion will tug at the hearts of readers and followers of Gaiman and Russell’s work. This volume’s art style and pacing is more cohesive and even than the first, perhaps due to the longer chapters and the variety in settings. Underlying messianic themes and the striking juxtaposition of the evil clan of human assassins and the benevolent band of noble monsters begs classroom discussion. Essential reading for fans of Gaiman’s original and those who enjoyed the first entry. What should I do if The Graveyard Book is challenged?